CHICAGO - There is blood in the water. The Brooklyn Nets can see it, smell it. And like an opportunistic shark on a hunt, they're eager to pounce. The bleeding prey here is the Philadelphia 76ers. Wading, gasping for air, and significantly diminished. Of the three teams which fell to lower seeds in the opening weekend of the 2019 NBA playoffs, the Sixers are the most vulnerable. Toronto, seeded second in the East, lost a nail-biter to the seventh-ranked Orlando Magic, 104-101. But the Raptors' plight isn't so dire because Kyle Lowry has a proven history of bouncing back in Game 2s. And they have Kawhi Leonard. Denver, seeded second in the West, turned the ball over in their last two possessions and choked away a 101-96 decision to No. 7 San Antonio. The Nuggets will sweat blood before disposing a Spurs team that doesn't beat itself with foolish miscues and poor shot selection. But like Toronto, the Nuggets will eventually prevail because they have more talent, more depth, and one Nikola Jokic, a 7-foot, 249-pound giant who has velvet hands that can pass deftly and finish under the basket. However, the prognosis for the ailing Sixers isn't so rosy. First of all, Joel Embiid 's knee is not 100 percent healthy, which is why he's questionable to play in this morning's Game 2. The affable, Twitter-happy mastodon had 22 points in 24 minutes in Game 1 but he didn't have much lift in his shots. Without him, the Sixers are doomed. Ben Simmons managed only nine points in 34 minutes and he had as many assists (3) as turnovers. His career free throw shooting - 58.3 percent - has always been problematic. It turned biblical in Game 1 where he clunked four of five, a sorry 25 percent rate. Can't shoot. Can't make free throws. Can't make plays. At some point, one has to wonder: What exactly can Simmons do? Jimmy Butler had 36 points and was the lone bright spot in the Sixers' Game 1 upset loss. But handing Butler the keys to the offense is not a sustainable recipe for success because he's more like a complimentary piece, not necessarily a franchise savior. Butler, who can split a locker room with the same intensity he splits defenders, can't be the fulcrum of the Sixers offense. Otherwise, he loses some of his bite on defense. Enabling Butler, shoving him front and center of a team's mission has had some bad endings. I've seen that movie play out in Chicago. It didn't end well. And if you don't believe me, ask those guys in Minnesota. Assuming they can address their internal misgivings, the Sixers will still have their hands full against a Nets team that is quick, creative, and can shoot the 3 as though they are the lite version of the Golden State Warriors. At the risk of sounding sacrilegious, Brooklyn's three-guard combo of DeAngelo Russell, Caris LaVert and Spencer Dinwiddie reminds me of the Detroit Pistons' Bad Boys of the 90s who paraded the dangerous trio of Isaiah Thomas, Joe Dumars and Vinnie Johnson. Russell, LeVert and Dinwiddie tormented the Sixers for a combined 67 points in Game 1, piercing through Philly's defense by employing switches or targeting weak chains for isolation plays. 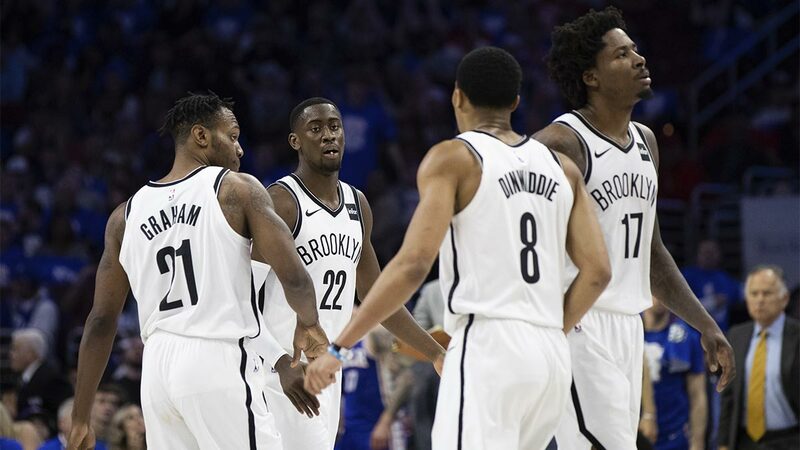 "They are tough off the dribble everyday for everybody," J.J. Redick, who fouled out trying to guard the Nets' speedsters, confessed to The Philadelphia Daily Inquirer. Philly's Amir Johnson drew a lot of flak for bringing his cellphone of the bench in Game 1. He better bring it again for Game 2 and put 911 on speed dial in case the Sixers need help to stop the bleeding. I'm not declaring the Sixers DOA just yet because one of the most dangerous things in this planet, to paraphrase the great Pat Riley, is a wounded animal. But then again, what if the beast is too wounded to put up a decent fight?